In my previous article, I discussed a common mistake managers make: They evaluate the “interactions with the boss” performance, and not the “doing your job performance.” So an employee can go through an entire year and not receive performance feedback on the work he was ostensibly hired to do, but receive lots of performance feedback on how he interacts with his boss. 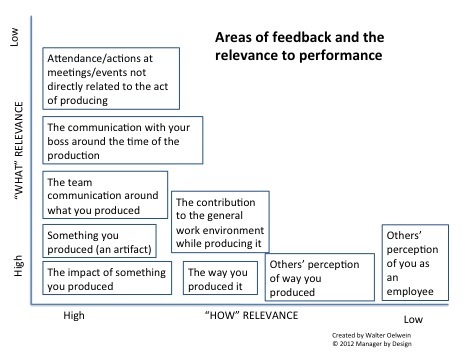 Given this concept of receiving feedback on the job performance vs. receiving feedback on the “in front of the boss” performance, let’s create a model to help managers get closer to the actual performance of an individual, and where the performance feedback needs to be. Here is a grid that looks at various elements that employees commonly receive “performance feedback” on. I put these elements into boxes along the “what/how” grid, with the most relevant to job performance being toward the lower left, and the least relevant up and to the right. In looking at this grid, you can see that what is most relevant is the impact of something produced, with the next most relevant elements being the actual thing you produced, and the way you produced it. Finally, the contribution to the general environment and the communication around the thing produced is the next most relevant element. The closer to the lower left, the closer it is it performance. c) is interested in protecting his or her ego. When a manager gives feedback to an employee, and the employee reacts negatively, this is probably a sign that the whole performance feedback process is new to either the manager, the employee or both together, which are all highly likely situations. It should be expected that initial performance conversations will be wrought with defensiveness, excuses, emotion, and other reactions. That is, they will be clunky. But if the tandem keep working on it, and try to have performance conversations over time, they will both get used to the process and stay increasingly focused on the performance and the desired outcomes. It should be expected that the more the manager and employee do something (in this case, have feedback conversations), the better they will be at it over time. Isn’t this true on just about every other activity? When the manager feels like the (initial) conversation isn’t going well – this should be the default understanding: “We’ll keep working at getting better at this,” rather than immediately assert that the “taking feedback” part is an inimitable defect in the employee. So to you managers out there, don’t be surprised when the first time you do something it isn’t perfect. Filed under People Management Tips · Tagged with Complex Feedback Situations, People Management Tips, Performance Feedback, Saying "you don't take feedback well"
The Manager by Designsm blog seeks to create better managers by design. Here’s a great tool that outlines a simple flowchart of when a manager should provide performance feedback, and when the performance management process should occur. It can be used in many contexts, and provides a simple outline of what a manger’s role is in providing feedback, and how this fits with the performance management process (click for a larger image). You’ll see that Performance Feedback starts at the task level, not the person level. You want to know what the task is, and make sure the individual gets feedback on how well he or she is performing the task. It also requires the manager to know what acceptable performance looks like. If not, then the manager is in a complex feedback situation, and both the manager and the employee agree to strategize on how to do the task differently, since it isn’t defined yet. 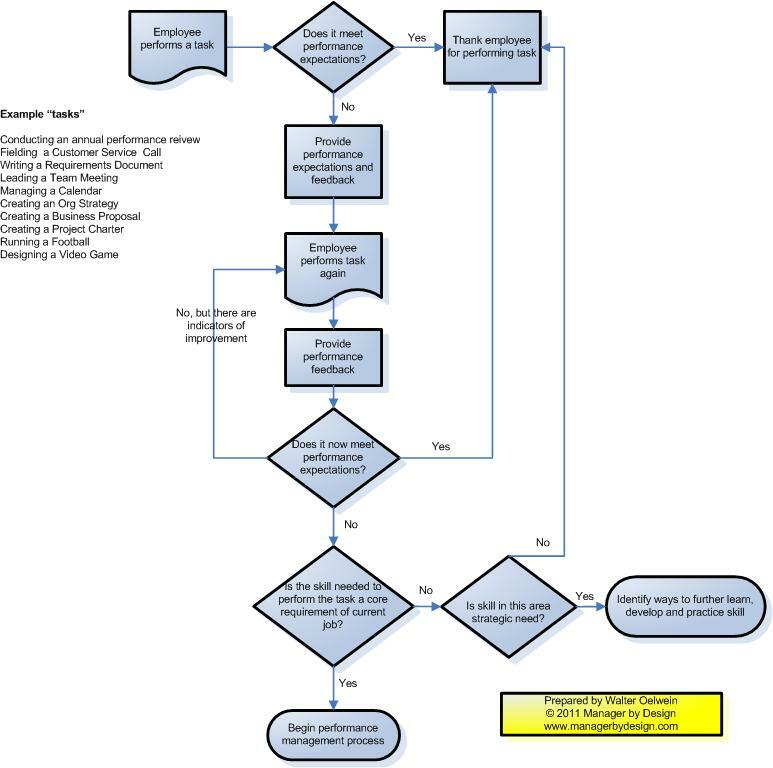 You’ll also notice that there is a lot of activity prior to the performance management process, which is actually a more formal version of this same flowchart. Managers need to perform this informal version first. Let me know what you think. 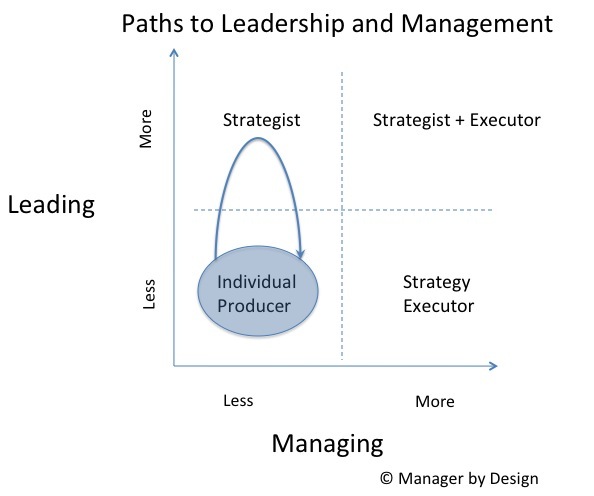 Do you your managers follow this flow chart? Do they skip steps? Do they add steps? The Performance Management Process: Were You Aware of It? When an employee does something wrong, it’s not always about the person. It’s about the system, too.